Pictured at left is our good buddy Kathy Hochul. 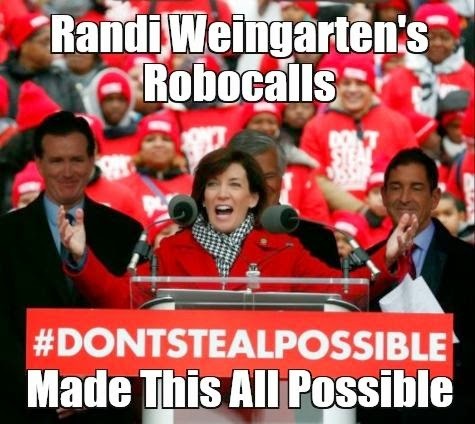 You see, while NYSUT and UFT made a big show of not supporting Cuomo, and of course failing utterly to oppose him, AFT President Randi Weingarten made robocalls for his lieutenant governor. Perhaps it was intended as some sort of balance to the general UFT/ NYSUT policy of doing nothing. Perhaps it was the best we could do without outright endorsing Cuomo. Who knows? As usual with the amoral reformy scumbags we get in bed with, Hochul shows her gratitude by stabbing us in the back the first chance she gets. It's hard to forget that after Bill Gates gave the AFT keynote he went out and attacked teacher pensions. The question, of course, is when are we gonna learn from our mistakes? How many times are we gonna kowtow to people who hate us and everything we stand for just so they can crap all over us? I guess there's some logic to this, but my mind just can't get around it. Norm Scott regularly posts explanations, but even after he explains it I don't understand. Even if we take the most cynical view possible, very few charter schools are unionized and there isn't a whole lot of cash making its way from charters to 52 Broadway. But UFT leadership's support of charters contributes to the cynicism and alienation of membership. Their miserable and humiliating failed foray into charters and co-location clearly displayed the lack of vision this blog has been documenting for the last decade. How many times do we need to fall on our asses before someone in leadership gets tired? How much inexcusable nonsense do working teachers need to experience before someone says enough? I guess if you're going into 52 Broadway every day, sitting in a nice clean office earning more than any working teacher, and listening to loyalty oath signers tell you what great work you're doing, everything seems fine. But if you actually do the work and teach the kids, you feel the pressure of the convoluted and idiotic APPR that Mike Mulgrew helped compose every single day. It's pretty easy for him to stand up in front of hundreds of enthusiastic sycophants, announce what a great job he's doing, and linger in the loyalty-oath inspired enthusiasm. But every teacher I know hates the new system, including those who get good observations. Who the hell understands all that crap on the forms? How can you say this aspect of teaching is important but that isn't? How can you say the contributions you make to a school are only important if you've done them within 15 days of being observed? A colleague reported to me yesterday that she'd completed all her observations. I guess now she can stop going to outside meetings and cease studying altogether until next September, because it's utterly without meaning. The idiotic notion that there are parameters, that this counts but that doesn't, that something as complex and variable as teaching can be reduced to an 8-point checklist should have been rejected outright by leadership. Instead they embraced it, and unceremoniously dumped the sitting NYSUT President when he started to show disturbing signs of independent thought. It's time for us to get off the reformy bandwagon. If leadership can't tell what we see and feel every day, they need to step down and make room for teachers who actually know what's going on. Just how out of touch do you have to be to remotely imagine Kathy Hochul represents working teachers?